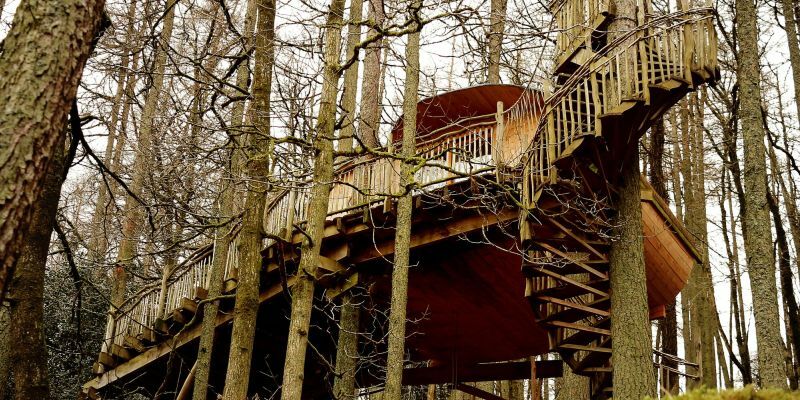 Take the family away for a woodland weekend, and get back to nature for 2 unforgettable nights during this amazing Treehouse holiday. For real family time, you can't beat a Treehouse stay. 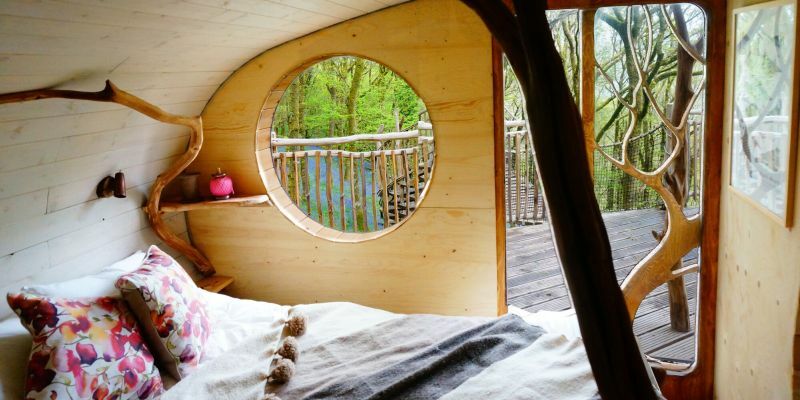 Stay in a treehouse, for a guaranteed family holiday with a difference. This is a truly 'back to nature' experience, allowing you to feel a wonderful sense of freedom from the hustle and bustle of daily life, without sacrificing any of your creature comforts. This treehouse holiday is the perfect opportunity for quality family time. You will feel wonderfully isolated from the real world, nestled under a canopy of trees, deep in the woods - yet still in the absolute lap of luxury. Your accommodation will be one of 4 top-notch Treehouses, designed and built to evoke a very organic and natural feel, while still ensuring you enjoy the height of comfort, so you feel as though you could be in a hotel. A shower, toilet and a kitchen are all provided too. The treehouse holiday is ideal for a family of four. The beds in the treehouse are as comfortable as they are stylish, and the decor throughout the chic little cabins is simple, funky and a little bit retro! The Swedish designer has ensured that there is a perfect mixture of style and substance. There is a wonderful wood burning stove in the treehouse for you to cook on, and any other fixtures run on solar energy. With a huge range of outdoor activities available nearby, this promises to be full-on family fun. Your Treehouse Experience will begin when you and up to 4 friends / family members have arrived at the Treehouse after 3pm on Day 1, your two night stay will encompass and include many great adventures & activities before you come to leave before 11.00 am on Day 3. The experience is for four people – with one luxurious double bed & two single bunk style beds. The bed that you will be sleeping in will be fantastically comfortable and superbly stylish, in line with the rest of the retro furniture, facilities and fabrics - as everything has been designed by a top Swedish stylist to be as good as it looks. Walks: From The Treehouse there are fantastic walks to suit all abilities. The terrain is fairly rugged, but you are rewarded by magnificent views and landscapes. Mountain Biking: For the adventurous; there are mountain bike routes to satisfy everyone from beginners to experienced riders. Bikes can be hired when you confirm the date of your stay. Beaches: The Treehouse is close to some of the finest beaches in Wales – and there are opportunities to try Kite Surfing, Kite Boarding and much more. You can prearrange these upon booking, please call us for more information. Alternative Therapies: A range of exceptional local healers and therapists are available, and can come to your Treehouse. Library: Each Treehouse has a small library, which includes guides to the local area and recommendations for visits and activities. Due to the extreme popularity of the Tree Houses, we recommend booking with at least three months notice. The Treehouse Experience for 4 is available year round, and you can book your break to start on Monday, Wednesday or Friday. The Treehouses are not suitable for groups of adults - they are designed for couples or families with children. Your car can be driven to within 400 yards of the Treehouse site, after which a small walk (over flat land grass) is required. Some Treehouses have spiral staircases as their primary access – please make clear at the time of booking if this is likely to cause difficulty. Sleeping arrangements: 1 Double Bed, 2 single bunk beds - if customers require a travel cot, they will need to provide their own. The Treehouse experience for 4 is for two nights – with arrival between 3:00pm to 4.00pm on Day 1 and departure before 11.30am on Day 3. The Treehouses are available for longer stays – please Make an Enquiry to find out more about this. Participants: The Treehouse Experience - Family is for 4 participants. Unfortunately there cannot be any spectators in The Treehouse (who would want to watch you having a great time!?) 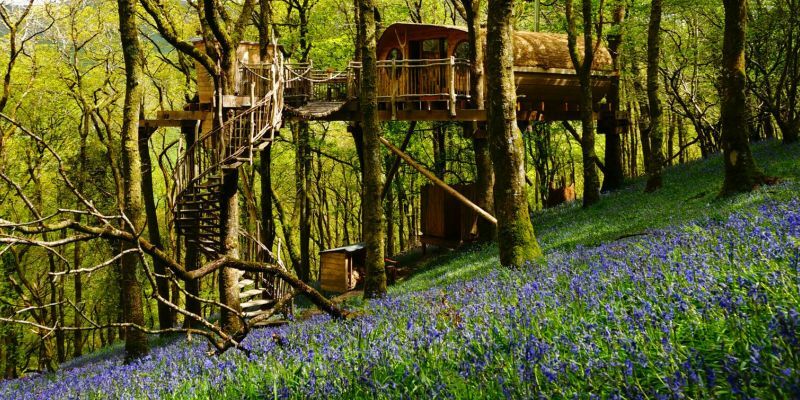 But this ticket is for 4 people (2 adults & 2 children), and more Treehouses can be booked together if required. Bring plenty of 'outdoorsy' clothes and boots – The Treehouse is in an unspoilt landscape, perfect for walking and exploring! In the Treehouse you will find firelighters, and a supply of firewood for the wood-burning stove. Extra supplies of wood are available to purchase. This is a self catering holiday, and you will probably love your Treehouse so much that you won’t want to leave! So we recommend that you bring as much food and drink as you can. Linen is supplied, but you should bring your own bath towels and toiletries. For basic provisions, there is an “honesty” shop at Treehouse. There is a small village shop two miles from Treehouse, and there is a local pub which is a picturesque 15 minute walk away. This experience is not weather dependent. The treehouses have been designed to be cosy and comfortable year-round. A truely magical experience - one that I will treasure for years! A fantastic experience for the family, the children loved it as did I! Take a good coolbox though as there Is no fridge. 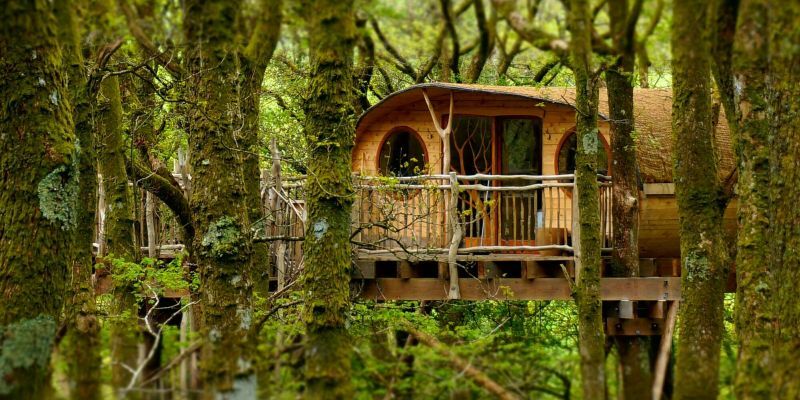 Set in the beautiful countryside of Bryn Meurig, Wales, you’ll find a number of unique tree houses. This is a fantastic experience as you get to stay overnight in one of the luxury tree houses, while spending the days exploring the breathtaking countryside and local area. We interviewed Mark from the Living Room, to find out really what makes his tree houses different to any others, which celebrity visitors he has had, any future plans for the business and much more! Q1: Could you tell us about the history behind how Living Room began? A: Living-room was created 6 years ago, after a pub chat! My background is in marketing events and experiences, and my business partner Peter has a background in product design and project management. We wanted to create an experience that enabled couples and families to live deep in the heart of nature, far from the outside world, in accommodation that sat lightly and beautifully in the environment. Q2: What makes your treehouses different to any other? A: We design and build the treehouses ourselves. They are real treehouses in that they are completely supported by the trees. We wanted them to be real homes in the canopy, with showers, kitchens, gorgeous beds and bathrooms. A lot of the technology we’ve used has been created specifically for this project – and (hopefully) they look gorgeous too! Q3: Why did you decide to locate yourself in Bryn Meurig, Wales? A: This is where we live – and luckily, this is one of the most remote and beautiful areas of Wales. We are a 280 acre sheep farm, with really magical woods, streams, rivers and waterfalls – perfect for a complete break from the modern world. Q4: Have you ever had anyone famous stay at one of the treehouses? A: Yes, lots! But we’re discreet! The treehouses have been seen of television all over the world, and have appeared in a huge range of magazines and books – from Lonely Planet to Vogue Paris! Q5: You describe the treehouse as like being in the luxury of a hotel room combined with the fresh feel of camping, how do you make this happen? A: A lot of hard work! The treehouses are extremely cosy – with woodburners, hot showers, luxurious beds – and are very romantic. However, as soon as you open the door, you are standing high in the tree canopy, with huge mountain views, surrounded by wild-life and raw natural beauty. Q6: Do you have any future plans for the business? A: Yes, we are thinking of building another project in a wood a couple of miles away … possibly next year (to open in 2019). Q7: Finally, how would you describe the treehouse experience in three words? Thank you very much to Mark from the Living Room, for answering our questions. After hearing more about the unique overnight experiences, we can see why they’re some of our top-selling packages! Would the Treehouse have the following: Shower, toilet and kitchen? All Treehouses are equipped with a shower, toilet and a kitchen. Please do remember to bring towels though.